I was one of those people that didn’t think much about what I was eating. For 40 years, I really didn’t think much about it at all. I would eat whatever was put in front of me, I would shop for food wherever it was convenient, and I would be happy just to not be hungry. All that changed when I met my fiancé Sima. She opened my eyes and my palette, and in the last 2+ years I’ve looked at food in a whole new way. I’m now very aware of what I’m eating and where it comes from. Americans in particular really take a lot for granted. It’s amazing when we eat imported foods, we never think about the long journey it came from its origin to your plate. We’re fortunate to live in a city that has access to real, healthy, raw foods, and we were so excited when the RAWESOME market opened right next to our new Whole Foods, on Rose Avenue in West Los Angeles. They have amazing food there, straight from local farms. They have delicious dairy and real, non-pasteurized milk. We’ve been enjoying our weekly visits and trying new foods: non-processed, the way nature intented. Every time we would visit Rawesome, we’d feel a little tension in the staff. They were raided and shut-down briefly last summer. 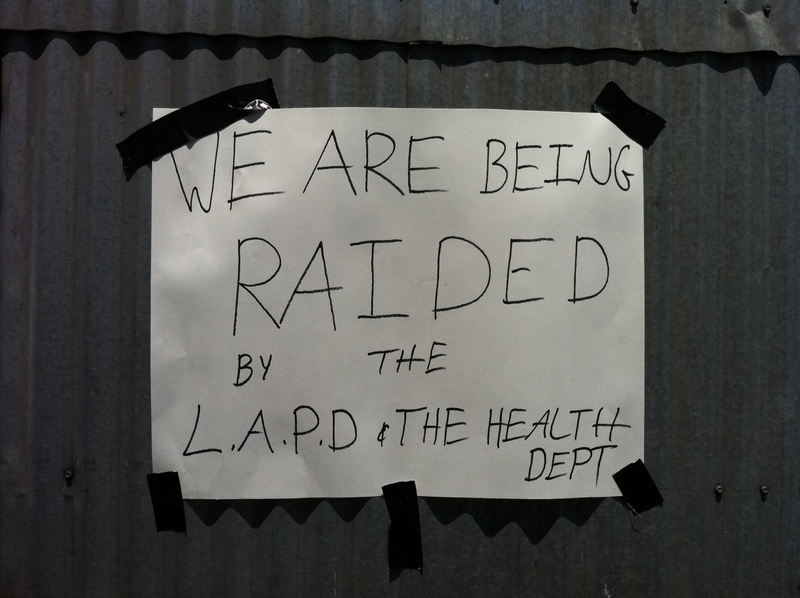 There was always that looming fear that it could all come crashing down again, which it did, permanently last week, as the LAPD raided and destroyed much of the inventory. I’m all for safety and I don’t want to eat something that’s dangerous, but let’s learn from the other countries around the world, including our own country. Our nation has become a victim of itself. We were once a shining example for healthy food production. But we’ve pushed aside health for capitalism, and it has failed. Companies like Monsanto put profit first, quality second. If there’s a market, they sell to it. We’re now the most obese country in the world. The problem is ignorance. It’s the ignorance that I grew up with. Organic should mean organic, but now because of abuse of the rules, we have “certified organic“. And labels and ingredients only work if you read and understand them. Sima and I have built our own garden. No pesticides, no chemicals, no sprays. Just seeds, soil, plants, and water. It doesn’t get that much sun, and it’s not super hot in Santa Monica, so we’re making due with the few tomatoes and zucchini we see each week. But now I appreciate food so much more, and nothing tastes better than the tomatoes Sima makes in her delicious salad, with greens from our local farmer’s market. I’ve learned a lot over the past few years, and have been inspired by my good friend Rich Roll and what he’s managed to do. Sima and I will often chat up the vendors at the farmers’ market, and just being around and thinking about food as much as we have has really helped me appreciate it. The other way to go is “eat whatever, don’t care” – like most of my friends, like most of my family, like most Americans. And there are many people that live to be 90+, eating whatever they want. I just know I feel better, stronger, and healthier now than I’ve ever felt. My skin looks great, I rarely get sick, my cholesterol is down, and I sleep better. I’ll stick with what I’m doin’.